I finally had my opportunity to paint live at the beautiful Oaks at Salem in Apex NC! I have known owner April Maness for awhile. 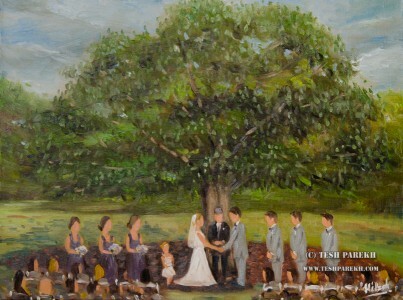 In fact, when I had painted my first ceremony painting at the All Saints Chapel in Raleigh, April was the photographer for that wedding. I did not have the opportunity to meet Allie before the wedding. What a beautiful bride! Joslin Rodely (Director of Event Coordination) was very helpful and I enjoyed working with her. I arrived before the ceremony. It was a beautiful day. The cloud cover kept changing while I painted the background, but when the ceremony started, it was gorgeous! Allie had wanted the Oak tree in the painting so I used horizontal composition. This was an 18×24 oil painting on linen (canvas). I painted the background before the ceremony. When the ceremony started, I made several reference sketches in pencil. I used those sketches for reference when finishing the panting. I took some photos to check details later, but, most of my painting was done from the life and memory. I sketch a lot. I carry sketchbook, pencil and painting supplies with me most of the time. And I sketch at every opportunity (there are no shortcuts to painting live!). After the ceremony, I continued to work on the painting. It was time to add all the figures. Once that was done, I applied finishing touches. Allie and Tyler were very happy with the painting! So, Joslin and I set it up on a display easel for the wedding guests to enjoy. A beautiful live painting- started and finished at the wedding! “Allie & Tyler”. Live wedding ceremony painting. Oil on linen. 18×24. 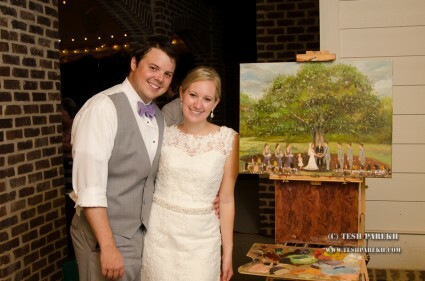 Tyler and Allie with live painting of their ceremony.